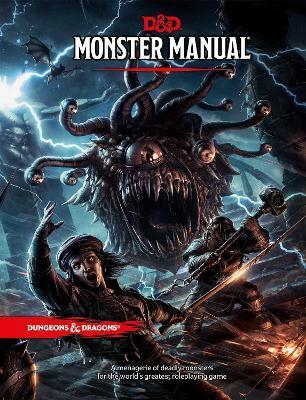 Fill your Dungeons & Dragons games with deadly monsters from the Monster Manual. - The Monster Manual is one of the three main Dungeons & Dragons books, along with the Player's Handbook and the Dungeon Master's Guide. It's an essential resource for Dungeon Masters to use in populating any type of challenge they might contrive for their players. - From an angel's wingspan to the vacant eyes of a zombie beholder, the Monster Manual includes more than 150 creatures illustrated in vivid color, with more than 400 quick reference tables to help you bring them to life with ease. - Rich descriptions of each monster help trigger your imagination. From the familiar ("vampires hate sunlight") to the arcane ("what color is the vapor from a gorgon's nose? "), the Monster Manual helps inspire your decisions and keep the game flowing smoothly. - In Dungeons & Dragons, you and your friends coauthor your own legend. Guided by a Dungeon Master, you create characters and play their roles in a story, rolling dice and navigating maps as you unfold a tale as limitless as your imagination. - Dungeons & Dragons is the world's greatest roleplaying game. Created in 1974, D&D transformed gaming culture by blending traditional fantasy with miniatures and wargaming.